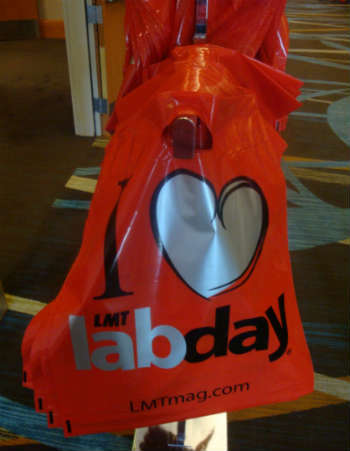 I attended both days of LMT's (Lab Management Today) Lab Day West this year. 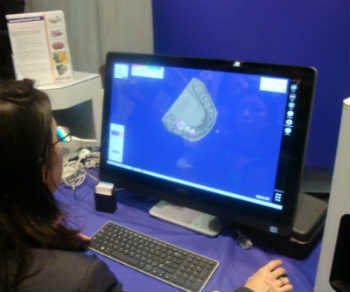 This is an industry trade show for dental technicians and the dental lab industry. Dentists don't normally attend this event. This is the 12th year in row that I made it to Lab Day West. It's nice to see how this show has grown and how the industry has changed, too. 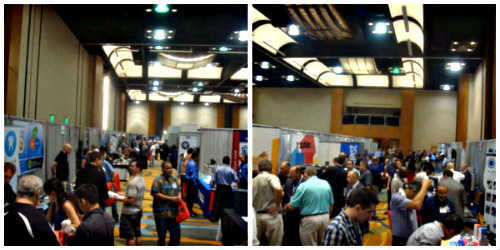 The event was held at the Hyatt Regency Orange County. A 5 minute drive from Disneyland. From what I could tell, most attendees are local to Southern California. However, I did run across people from outside California as well. Getting coffee at Starbucks in the morning, before the educational sessions started, was hectic. All the Disney tourists decided to get their caffeine fix at the same time.The line poured all the way into the middle of the hotel lobby, which was huge. 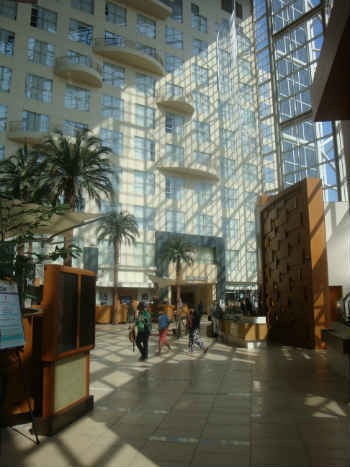 The lobby fits inside a glass atrium, over 10 stories high. It also has two restaurants, a Starbucks, and two convenience stores; with plenty of room to spare. Take a look at it below. Most years I'm too busy with work to make both days at Lab Day West. But this year they had a couple of Friday classes I wanted to sit in on. I'm glad I did. I learned a lot at the show. Most classes I attended were lectures, some were hands-on demonstrations, but all were very interesting. I can't wait to get to the lab and try out some of the new tricks I learned. I'm such a dental tech geek! Full Arch Ziconia Hybrids - The presenter, Bill Marais, RDT, first lectured and then demonstrated how to achieve predictable results fabricating full arch zirconia hybrids using material from a company called GC. Prepless Foil Veneers - I've been doing more of these lately at work. Mr. Von Grow gave a hands-on demonstration on his techniques. Very helpful. I sat in on two classes by Joshua Polansky, MDT. One was called Old Wisdom-New Science. He spoke on the importance of proper communication between the dentist and the technician. "...from initial treatment plan throughout the case. Focusing on photographic relationship-based and restorative communication... how to simplify the nightmares... restoring difficult patients [cases]." Then I sat in on a hands-on class, It's All in the Details, where Bill Parks, CDT, AAACD shared his principles for selecting ingots, shade evaluation, tooth contour and morphology for single-tooth anteriors, and more. This was exciting stuff. I can't wait to help dentists make their patients more beautiful. The trade show exhibit seems to grow every year. The biggest change in the last 3 years is the ongoing evolution of computerized milling. 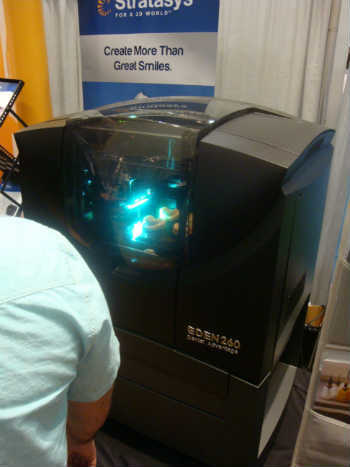 Machines can do much of the work to create customized dental restorations. One of the sales reps told me that there are three basic methods or technologies to accomplish this today. Subtractive - This is the first kind of milling technology I was exposed to a few years ago. Basically, the lab starts out with a solid block of material, instructions are fed into the milling machine, and it chisels or cuts away the excess material until a rough tooth is left over. This then goes to human hands to finish. 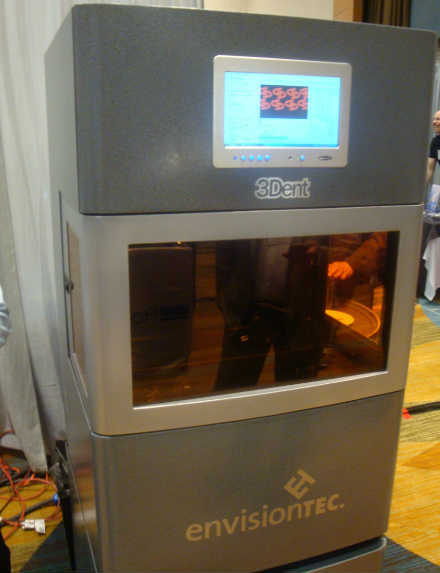 Additive - This is a bit newer and what I call 3D printing. Instructions are fed into the machine and the machine, using different kinds of material like wax for instance, builds the tooth layer-by-layer. Like it's printing in 3D. Some laser thingy - I forgot what the sales rep called it, but instructions are fed into the machine. The material starts out in liquid form. Then a special laser shoots a ray of light into a specific spot inside the liquid. At that precise point, the liquid hardens into a solid. 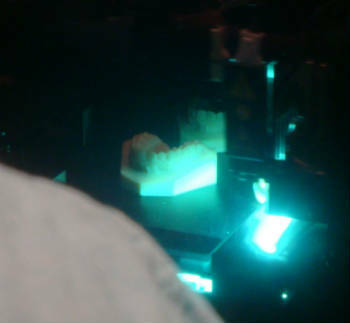 This process continues as the machine builds the tooth point-by-laser-point inside the liquid. Pretty soon they'll be able to teleport us like in Star Trek. Or build portable dental labs that are bigger on the inside than on the outside like Doctor Who's Tardis. These machines come in all sizes and price points. You can't tell from the photo, but the machine above on the left is about the size of a refrigerator. The one on the right could sit on your desk at home. The good news, like all technology, when it gets adopted and companies start competing, it gets better and costs come down. Indoors, it was nice and cool because of air conditioning. But outside was blistering hot. 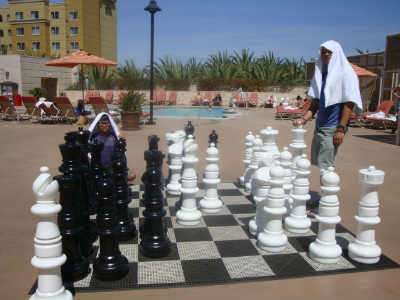 Here are a couple of other Lab Day West attendees playing chess outside in the hot afternoon. They put towels on their heads to block some of the sun. Luckily, there was a pool to enjoy, too.